The Hernia Calculator from the University of Pennsylvania Health System was developed from data spanning a 7-year time frame and over 78,000 patients across multiple states. It is officially titled the Incisional Hernia Risk Prediction Instrument and is designed to estimate the chance of a patient developing an incisional hernia after abdominal surgery. Using a set of surgical risk models, providers can input patient demographic and health information to receive the probability of that patient experiencing (independently) a hernia, an operative hernia, and a surgical site infection. This regression model includes comorbidities, preoperative surgical and health data, and postoperative outcomes. Interestingly, the app also provides the predicted and average cost of care for each case. Developed by the Society for Pediatric Anesthesia (SPA), Pedi Crisis 2.0 is a pocket resource of pediatric emergency algorithms. It contains 26 crisis situations in an organized and clean format. 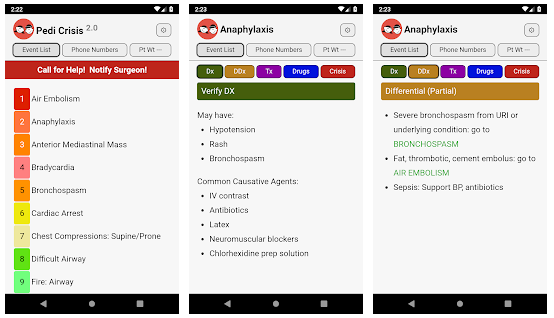 The main screen enables quick navigation to personalized emergency phone numbers, customizable patient weight, and an alphabetical list of the 26 emergencies. Topics included are air embolism, anterior mediastinal mass, cardiac arrest, and fire in the operating room. Each situation is further broken down into the following categories: diagnosis, differential diagnosis, treatment, drugs, and crisis. Applicable drugs are able to be viewed either as doses per kilogram or as the calculated dose based on provided weight. The crisis tab provides an excellent opportunity to walk through a provider’s preparedness, as well as a facility’s resources and policies. 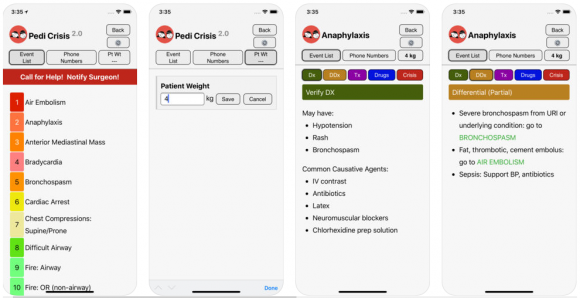 The Pedi Crisis 2.0 app was developed by the Society for Pediatric Anesthesia (SPA). It details 26 pediatric emergencies, including weight-based drug dosage summaries for each. An easy to navigate home screen allows users to quickly view all events in alphabetical order, emergency phone numbers, or input patient weight. Each critical situation, such as air embolism or cardiac arrest, is further broken down into these five categories: diagnosis, differential diagnosis, treatment, drugs, and crisis information. This categorization is consistent for all emergencies within the app. Drugs are listed by dosing per kilogram, as well as the calculated dose based on patient weight provided by the user. The step-by-step crisis management steps are an invitation to the user to ensure his or her readiness in this type of situation. MKSAP 18, or the 2018 Medical Knowledge Self-Assessment Program, is an interactive continuing education app from the American College of Physicians (ACP) designed for internal medicine physicians. It includes over 1,200 multiple choice questions based on provided text sections. The questions are all original and unique to MKSAP. They are based on provided patient scenarios and up-to-date evidence-based research. Topics range from fundamentals of internal medicine to all its subspecialties. Users can save questions and notes within the app, and all texts and questions can be accessed offline. The content supplements the other subscriptions available from the ACP, both Digital and Complete. Providers use the same log-in information across all platforms.